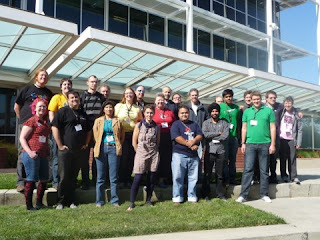 In mid October a Document Summit was held at Google headquarters in Mountain View, California where documentation teams from 4 open source projects, KDE, OpenStreetMap, OpenMRS and Sahana Eden as well as a few documentation ‘free agents’ gathered to a write 4 books in the course of three days and take part in a two day unconference. Below, one of the dedicated documentation volunteers and the FLOSS Manuals founder/organizer recount their experiences over the course of the week. This past month, Google took a big step toward giving documentation its due with a five-day Google Summer of Code Document Sprint. The event was inspired and driven by FLOSS Manuals, an organization of volunteers (of which I'm one) that has received increasing recognition for its documentation projects and the related community-building they stimulate. It was predicated on the realization at Google (and at least among pockets of open source developers) that free software needed more than good coders to be successful. It needs communities of people caring for each other and guiding each other through the best use of the software, and part of this community effort is good documentation. To understand the five-day conference itself (which I wrote about extensively on Radar), you have to know something about FLOSS Manuals and its intense "book sprint" process. FLOSS Manuals was started by artist Adam Hyde several years ago to fill the gap in free software's documentation. From the start it focused not on small articles or wikis but on full manuals. Adam developed the book sprint as a way to pull together a community and get something done quickly that everybody could point to as an achievement for their community. Five to ten developers, power users, and core supporters meet in a workplace for three to five days and write, sharing their work. Remote contributions are encouraged, and outsiders often weigh in with key points. It's a chaotic process that converges suddenly on the last day into a 80-page to 150-page book, and it leaves a high-endorphin sensation among the participants that propels them toward other community-related activities. Books are frequently translated into other languages, are available both on web sites running FLOSS Manuals software and in print, and are kept "live" so that people can contribute to them later. My Radar articles contain my own lessons from the Google/FLOSS Manuals sprint. The four projects that participated took back not only a book but guidelines for keeping it alive and capitalizing on the educational and promotional activities that a book permits. The Google Summer of Code Document Summit was the first of its kind - a special mix of formats with an unconference and book sprint tied together. This promised to be not only intensive and productive but exhausting! We kicked off the first day of the summit with a one day unconference facilitated by Allen Gunn. It was a great way to get started, we covered many interesting topics related to free documentation. At the end of the day everyone was tired yet inspired. We also started to really come together as a group quite quickly under Allen’s guidance and there were many smiling faces and intensive discussions on the bus back to the hotel. Day two - start sprinting! Well, the start of an ambitious process - 4 parallel book sprints. Zero to book in 3 days with 4 concurrent projects. I had a pretty good feeling it was going to work, having now done 30 or so sprints, but facilitating 4 sprints concurrently is extra tricky. Thankfully Anne Goldenberg (on the board of the French FLOSS Manuals) was there as I am training her to facilitate Book Sprints. I briefed Anne and she started working through the sprint with the OpenStreetMap team and I began facilitating Sahana and KDE while Allen helped here and there a lot for the first day especially with the generation of the table of contents and oiling the engine for OpenMRS. We also divided the "free agents" (people not affiliated to projects) to the groups. Well, the rest is more or less the Book Sprint process. Writing, reviewing, discussing, workshopping and using the various tricks and methods developed over the last 3 or so years with this methodology. All went pretty smoothly. We finished 4 great books in 3 days. I think the final word counts were something like 25,000 words or so for each of OpenStreetMap, OpenMRS, and Sahana Eden; 10,000 or so words for KDE. Laleh Torabi designed some wonderful covers for the books and Tuukka Hastrup was there working on a special new development for Booki (the platform we use for Book Sprints). Tuukka finished the beta and implemented it about 35 seconds before we were planning to use it and he didn’t even sweat! After dinner on the 3rd sprint day we invited Sahana Eden up to the front of the group and they used the new Booki feature to export the book directly to lulu.com (a print on demand service). Thats right, one push of the button and their book was IMMEDIATELY for sale as a paper book online - it was magic! The last day was feedback and a debrief unconference facilitated by Allen and then... you thought it had ended? No! The Google Open Source Programs Office team had agreed to get paper books printed so we distributed 20 each of the four *beautiful* books to the mentor summit the next day. All bound and shiny...they looked amazing and set off quite a buzz. Many thanks to everyone involved. Especially the fabulous Google Open Source Program team. With this Document Summit, Google had the opportunity to support 4 important projects and the overarching need for good documentation of free and open source software.